Rio Paralympics 2016: What can USA learn from China? Collecting gold medals was a breeze for Team USA at the Rio Olympics - 46 golds won and a total of 121 medals secured in 19 triumphant days. A nation captivated. A medal table topped. But for the Paralympics the picture did not have such a golden hue for the Americans. There were some outstanding performances, but the team was overshadowed and outperformed, and that has been their Paralympic tale for the past 20 years. In finishing fourth in the Paralympic medals table, the United States came behind Ukraine - a nation still in the middle of military conflict - Great Britain and China. It was a relatively poor return for a country of such rich sporting traditions. But why is there such disparity in the overall team performance of America's disabled and non-disabled elite teams? Is it right to expect America to dominate the Paralympics? And what can the country learn from China's success? It has been more than two decades since the United States topped the medal table at a Paralympics and only once have they gone better than fourth place on foreign soil in that time - a third-place finish in Beijing in 2008. China, meanwhile, have dominated at each of the past four Paralympic Games and swept all before them in Rio, winning 92 more medals than nearest rivals Britain and becoming only the third country to win more than 100 gold medals at a single Games. America's Paralympic story is as ordinary as Ukraine's is extraordinary. Ukraine were 31 places below Team USA in the Olympics medal table, but one place above them at the Rio Paralympics. They are reaping the rewards of foundations set by Valeriy Sushkevych, founder and president of the Paralympic Committee of Ukraine, who helped develop a physical education and sport programme for young people with disabilities. But reasons for America's unsatisfactory Paralympic return runs deeper than the absence of a Sushkevych-type talisman. The biggest issue is a lack of significant funding. The US Olympic Committee (USOC), unlike almost every other country's Olympic committee, does not receive government funding. This means US athletes rely entirely on commercial sponsorship to pay for their training and living costs. With money raised through sponsorship deals with major brands such as Coca-Cola, McDonalds and Visa, USOC hands out about $50m (£39m) a year to US athletes across different sports, with the Rio Paralympics team receiving about $4m (£3m). Meanwhile, the Chinese government is aiming to develop a £647bn sports industry by 2025 and in recent years has increased its investment in sport, including football, Olympics and Paralympics. As of 2016, China has trained more than 42,100 fitness instructors for the disabled and has built 225 provincial and 34 national specialised sports training centres. The China Disability Sports Training Centre in Beijing, opened in 2007, also provides state-of-the-art facilities for disabled athletes. "We have scouts at county level to discover the talents, run city-level selections, targeted training at provincial level, and the final preparation at national level," said Ms Zhang Haidi, head of the Chinese Paralympic delegation in Rio. While China provides the facilities and puts programmes in place to develop their athletes, they do not fund them until they have won medals. Success, though, is rewarded with life-changing sums of money. For an American Paralympic athlete the financial reward for winning gold in Rio was, according to CNN, about $5,000 (£3,800). Eight-time Paralympic gold medallist Candace Cable says financial hardship "is a constant" for many disabled athletes in the United States. Greg Brigman, who was born with cerebral palsy, was part of the US men's Paralympic football team in Rio. He is an engineer by trade but had to give up his job in order to pursue his dream of competing at the Games. "Due to the travel requirements for Team USA, I have not been able to meet the full-time responsibilities of my job... and I was asked to resign," Brigman wrote on his GoFundMe page as he turned to crowd funding to help cover some of his living expenses and bills. "I ultimately chose to resign. I do not want to be an old man looking back and saying, 'Why did I not pursue this?'" The most recent census revealed there were 85m disabled people in China, compared with 56m in the United States. Such a large base of potential athletes meant they were able to send a delegation of 308 - more than any other country. Awarding the 2008 Games to Beijing transformed Paralympic sport in the country as China began to invest heavily and brought disability into the public eye. "Chinese people were able to understand disability better than before," Xiaojie Zheng, secretary of the Hong Dan Dan centre, an organisation supporting the blind in Beijing, told The Independent in 2012. "Many disabled people became more confident, asking about their rights. Before [the 2008 Games] they had been very quiet." Britain's most successful Paralympians - Jonnie Peacock, Aled Davies, Ellie Simmonds - became household names in London 2012, such was the fervour surrounding a home Paralympics. And there was a further breakthrough in Rio. Extensive coverage on Channel 4 and the BBC, combined with continued success, ensured reputations were enhanced in Brazil. The UK tops the Google Trends chart in searches for the Paralympics (the US is 25th), while Channel 4's The Last Leg: Live from Rio attracted an average audience of 1.8m for its nightly shows - up 47% on its initial run four years ago. US media was criticised for its lack of coverage of the Paralympics four years ago, where rights holder NBC did not show any of the Games in London live, and there was once again a lack of widespread coverage of Rio. Fans had to turn to a cable channel, NBCSN, or NBC's website to follow events, while there was barely a mention of Paralympic feats on the news. In China, it was a similar story. 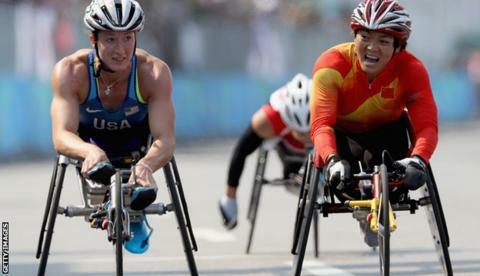 China Central Television's (CCTV) sports channel provided only one hour of Paralympic coverage per day. In contrast, the Olympics was shown live throughout. When Yuan Yanping won her third Paralympic gold in Rio, there was barely a mention of her achievements in the media. Lessons to be learned from China? China has worked hard to highlight equality in sports participation. Next year, the National Games of Disabled Persons will be held right after the National Games in Tianjin, marking the first time the two games will be held consecutively in one place. America is preparing to bid for the Games to be held in Los Angeles in 2024 and treating Paralympics on an equal footing with the Olympics is believed to be part of its pitch. The US may be lagging behind China in terms of Paralympic success at the moment, but the desire to improve appears to be there. Read more on US Paralympic team - should do better?